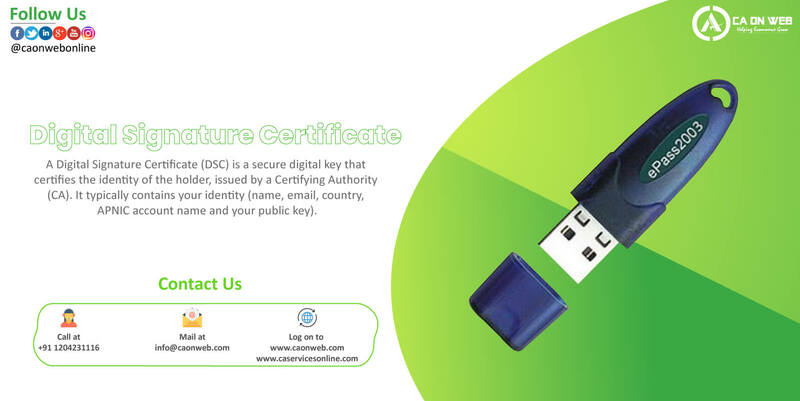 A Digital Signature Certificate (DSC) is a secure digital key that certifies the identity of the holder, issued from a Certifying Authority (CA). It typically contains your identity (name, email, country, APNIC account name and your public key). Digital Certificates use Public Key Infrastructure meaning data so that has been digitally signed or encrypted by a private key can only through decrypted by its corresponding public key. A digital certificate is an electronic “credit card” that establishes in your credentials when doing business or other transactions on the Web. Digital Signature Certificate ( DSC) is a mandatory at Income Tax Department for all the Individual, Partnership firm, Companies, HUF, BOI, Chartered Accountant, Tax Practitioner etc who are coming under the preview of Tax Audit or professional doing tax audit. A valid Class 2 Digital Signature is required for the same. A Tax Payer who is not coming under the TAX Audit may also file the return through Digital Signature and no need to send the receipt in the acknowledgment by post into CPC Bangalore. If an Assess is using Digital Signature for Filing, Returns accepts immediately. Class 3 A/B Digital Signature Certificates for Patent / Trademark, IPO, Copyright. Department of Patent Designs and also Trademark initiated an online filing facility for users who wish to apply for Trademark, Patent. Controller General for Patent Designs and Trademark mandate Digital Signature Certificate to file Trademark / Patent application filing by an individual. Any individualistic person / Org can apply for patent/ trademark online with Class 3 Digital Signature Certificate-Signing Only. Class 3 Digital Signature Certificate is the highest scale of the digital signature in ways of security. Class 3 Digital Signature Certificates ensures secure transactions, transparency. Class 3 Digital Signature comes in two validity, 1 Year and 2 Years. As per Information Technology Act, Digital Signature Certificate (DSC) for the single person, Companies and Organizations is compulsory to take part or who wish to take part in e-Tendering, e-Procurement, e-Ticketing, IPO, Patent, and Trademark filing process on multiple websites in India. A Digital Signature Certificate (DSC) is necessary for companies and organizations so that take part or intend to take part in e-Tendering processes on various Government sites. Besides enabling e-Tendering which is extremely suitable and transparent, a Digital Signature Certificate also ensures greater security in other online transactions. E-Procurement facilitates, integrates, and streamlines procurement processes. From buyer to the supplier and even back. Approved under the Information Technology Act, and with legal status, a Digital Signature Certificate is compulsory for all e-Procurement processes. Applying for a government tender online has many benefits. Since documents are uploaded to a central site, acknowledgments and receipts are provided immediately. Which is not the case with paper documents that need to be scanned and verified before being processed. E-Procurement has gained significant popularity and acceptance as it brings greater transparency to the whole system. Among variant benefits, it helps buyers and bidders overcome geographical limitations, reduce procurement cycles, and overall helps keep pace with present technology. Any organization that is looking to apply for any Government e-Tender needs to have a Class 3 Digital Signature Certificate registered in the name of a representative which is authorized to submit online offers for e-Tendering applications.